George Graham Reviews Jorma Kaukonen's "Blue Country Heart"
The current revival of bluegrass has had some interesting consequences. It has paved the way for a new generation of outstanding young artists who are taking the music to new places, people like Alison Krauss & Union Station and Nickel Creek. It has also seen renewed public interest in long-time artists like Ralph Stanley doing traditional-style music, and it inspired some popular artists to revisit a style that was part of their musical background, people like Dolly Parton and Ricky Skaggs. This week we have another example of an established artist going back to bluegrass-influenced roots, though unlike most of the other such personalities in the latter category, it's someone whose popularity was not in country, but in blues and rock, going back to the psychedelic days. It's Jorma Kaukonen who has just released Blue Country Heart, a collection of old-time country and bluegrass songs performed with some of the significant instrumentalists of the New Acoustic scene. Jorma Kaukonen is best known for his co-founding of the seminal San Francisco rock band the Jefferson Airplane. But his musical upbringing was in the folk days of the late 1950s and early Sixties, when playing folk music meant traditional material. Kaukonen had a childhood spent in various locations, with his father working for US Foreign Service. One of his early musical interests was in a Pakistani slide guitar called the veena. After returning to the US at age 16, at the time of the late-1950s folk music boom, he began to take a great interest in old-time country music of artists like the Carter Family. In 1961, he transferred to the University of Santa Clara in California, and there he eventually met Paul Kantner, and the two decided for form a rock band, which came to fruition in 1965, and adopted a name suggested by Kaukonen, the Jefferson Airplane. It's interesting to note that on the group's second album Surrealistic Pillow Kaukonen recorded what was probably the first solo acoustic guitar instrumental on a popular rock album, the classic Embryonic Journey. Kaukonen pursued his interest in acoustic country blues, in the tradition of the Reverend Gary Davis, who was an early hero to Kaukonen, by launching Hot Tuna, with his friend and fellow Jeffersonian, Jack Casady, originally as a side project in 1970. Hot Tuna has continued on and off to the present, though it has often been quite electric after acoustic beginnings. Kaukonen writes in his liner notes to Blue Country Heart that the idea for this CD has been in his head for a few years -- getting together in Nashville with some outstanding players who have become his friends, to do some of the old country-songs that Kaukonen grew up on, in his words, "back when country borrowed extensively from its across-the-railroad-tracks accomplice, the blues." There are quite a few songs that those who lived through the original 1960s folk music scene may well remember from remakes at the time, and endless performances at hootenannies, but they are songs, which for the most part, have not been heard in quite a while, in part precisely because they became almost cliches in the 1960s. But the passage of time has treated them well, and treating them even better are the gathered musicians on Blue Country Heart. Joining Kaukonen are a who's who of New Acoustic Music, New Grass Revival founder Sam Bush on mandolin and fiddle, the ubiquitous Jerry Douglas on Dobro, bassist Byron House, and banjoist extraordinaire Béla Fleck, who appears on two tracks. The CD also serves as a reminder that guitarist Kaukonen is no slouch on his instrument. He does all the lead vocals in the voice familiar to generations of Hot Tuna fans. A collection of musical chestnuts like this has the potential to be an exercise in either self-indulgence or nostalgia or both, but the quality of the musicianship is so fine that it's hard to quibble with the idea of digging up the old songs, and they come up with 14 of them from classics by Jimmy Rodgers and the Delmore Brothers to a couple of old pieces that approach novelty numbers. But they are all very tastefully performed, with few liberties being taken with the songs other than some instrumental solos. The CD also imparts the unmistakable feeling that the gathered musicians are enjoying themselves. So even though they may not really be conveying anything particularly new, the CD is thoroughly infectious, making you want to sing along just like in the old folk music days. 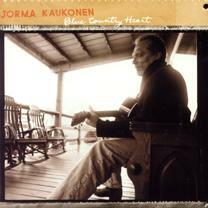 Veteran guitarist Jorma Kaukonen's new CD Blue Country Heart is well-named. It's a great mixture of the old country, blues and bluegrass music that influenced Kaukonen as he was growing up, served up by some of the best pickers in Nashville these days. For those following Kaukonen's career, especially his work with the very electric Jefferson Airplane and Hot Tuna, the CD might come as a bit of a surprise. But Kaukonen sounds very much at home, and the gathered players on this CD create what could well be the new definitive versions of some of these old songs, many of them remembered to those old enough to have been witness to the pre-Dylan folk music scene of the late 1950s and early Sixties. A lot of these songs were played to death back then, but hearing them now, performed with as much class as they are, gives them new life. And the revived interest in bluegrass and traditional country in the wake of the hit soundtrack from the movie O Brother Where Art Thou provides an environment where this CD is likely to be well-received. Interestingly, it was released on a major label, which perhaps a year ago would probably never considered something as traditional and acoustic. Our grade for sound quality is close to an "A." The acoustic instruments are well-recorded and the sound is clean and unfettered by needless electronic effect, though in keeping with unfortunate industry practice, the CD was compressed to make it louder than it needed to be for this style of music. Interestingly, this album is also available in the new Super Audio CD format and in surround sound, though I have not had an opportunity to audition it in that configuration. While nostalgia can get tedious quickly, sometimes we are reminded that there are some great old songs out there. Jorma Kaukonen' Blue Country Heart combines two generations of musicians who all have a great time with the classic material, and deliver a CD that's a real pleasure.